Most Intriguing First-Round Matchup: The first round of play begins Saturday, and we’re interested in seeing how a desperate North Texas team handles the high-octane attack from Troy. Back in January, when UNT looked like the league favorite, the Trojans shocked them with an easy home win. Although that’s not a marquee victory anymore for coach Don Maestri, a win in the SBC tourney Saturday would be a nice accomplishment to build on. North Texas simply did not defend in that first loss, and it’ll need to contain those speedy Troy guards to advance to the quarterfinals. Best Potential Matchup: The best game of the tournament may take place in the semi-finals at the top of the bracket. Florida Atlantic could get a shot at redemption against the ULL team that pulled the upset in Boca Raton just a few weeks ago. FAU’s Kore White and Brett Royster can form a scary frontcourt, but ULL’s bigs outrebounded the Owls by 13 in the last meeting. That’s a storyline to watch if this match-up materializes on Monday. Saving His Job? : There’s been no official news on the job status of WKU coach Ken McDonald. However, he’s obviously got to be sweating after this season’s disappointment and a failure to make the NCAA Tournament last year with A.J. Slaughter and Jeremy Evans. If Western Kentucky does not capture the crown on Tuesday, is there a possibility the school may not retain him as head coach? Nobody knows for sure, but it’s an interesting development to consider. Five months ago, the Sun Belt Conference looked like a two-team race. Defending champion North Texas and its four returning starters were the easy pick to return to the NCAA Tournament, but the talented and athletic Hilltoppers from Western Kentucky were certain to re-establish itself as the league’s premier program. A competitive 2010-11 season was in store—could the league produce two postseason teams? Well, folks, all that talk began before we started playing the games. Once the Sun Belt teams took the court, all hell broke loose from November to March. The two pre-season favorites in the SBC, North Texas and Western Kentucky, failed to even finish above .500 in their respective divisions. WKU’s challenging non-conference schedule backfired, leading to a 5-11 start and rumblings that coach Ken McDonald should lose his job. Down in Denton, UNT ripped off 13 of 15 wins to begin the season, including a road victory at LSU by 20 points. From there, the vaunted senior class could not overcome depth issues and fell apart, sliding to the middle of the pack in the West Division. With the conference wide open, pre-season sleeper Florida Atlantic took advantage of the opportunity. Nobody’s asleep on the Owls anymore, not after they won the East handily and earned the top seed in the conference tournament in Hot Springs. Point guard Ray Taylor’s season did not begin well, as he missed time for disciplinary reasons and struggled to find his game. During conference play, though, the sophomore became the key to FAU’s success. Running the offense with fellow point man Alex Tucker, the Owls were more patient and disciplined this year, but the overall team defense is the reason Florida Atlantic improved from “sleeper” to conference champion. One look at the West Division in 2010-11 is all you’ll need to understand the craziness of the Sun Belt Conference. Denver, the team that started 6-0 in league competition, won just two games in February. The two squads with the best non-conference resumes, North Texas and Arkansas-Little Rock, are nowhere to be found at the top of the conference. Instead, the two teams that shared the West title at 11-5 won a combined four games against non-conference, Division I opponents. Arkansas State finished undefeated at home and won seven of nine down the stretch. With John Brady at the helm and a good group of returnees, we expected the Red Wolves to compete for a title. We did not, however, expect much at all out of Bob Marlin at Louisiana-Lafayette, in his first season at the school after leaving Sam Houston State. In the middle of January, the 3-14 Rajun’ Cajuns, battling all kinds of injuries and personnel issues, were in full rebuilding mode. And then the unthinkable happened: ULL became one of the nation’s hottest teams. It’s won 11 in a row—the second-longest winning streak in college basketball right now— and shared a division title, despite sitting near the bottom of our power rankings almost the entire season. 1. Florida Atlantic (13-3, 21-9—Projected NCAA Seed: 15): If FAU captures the SBC tourney crown, most media outlets project Florida Atlantic as a candidate for a play-in game. 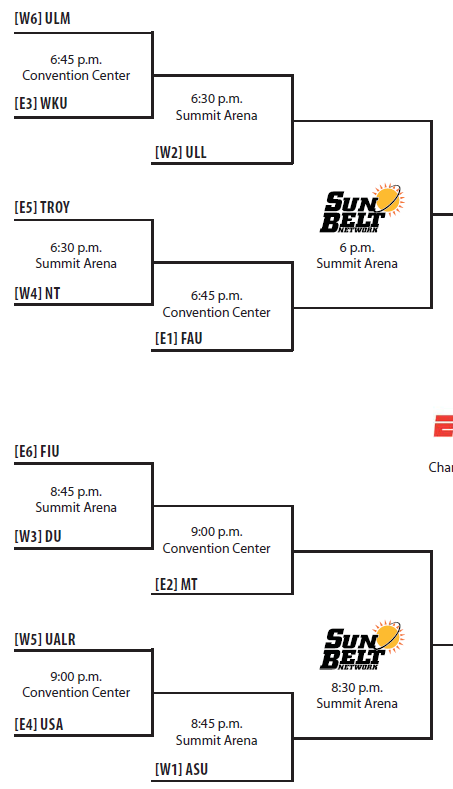 That’s a sad sign of the rough times in the Sun Belt, but we’re not sure a number one seed would necessarily beg to play the Owls in a first-round match-up. No, we’re not bold enough to predict that the top seed will fall in the opening round in 2011 for the first time in history, but we’re at least bold enough to say that this team has the pieces to scare the daylights out of somebody. Think about it. The coach has made a trip to the Elite Eight. The center is among the nation’s leaders in blocked shots. The Owls have quick guards that can score and they’re somewhat battled tested with wins over South Florida, Hofstra, Wisconsin-Milwaukee and Mississippi State. That’s not a bad resume for a potential 16-seed. 2. Middle Tennessee State (15-15, 10-6): Kermit Davis’ team did not play well in late February, even losing at 4-23 independent Houston Baptist. Besides point guard James Washington, the heart and soul of the Blue Raiders who started 29 games last season, this roster doesn’t have a whole lot of conference tournament experience. Jason Jones has added a new dimension after transferring from UTEP, though, and he’s a difficult match-up for any Sun Belt squad. 3. Western Kentucky (14-15, 8-8): It’s no secret that WKU’s season has been a bit of a disgrace. After an 0-4 start to conference play, the team did rally and showed signs of urgency at times. Still, the Hilltoppers fell short of a first-round bye, and they’ll now need to win four games to advance to the NCAA Tournament, a goal that seemed attainable in November. Western Kentucky’s probably not headed to any other post-season tournament, so this weekend could be the last we’ll ever see of Sergio Kerusch, Steffhon Pettigrew and Juan Pattillo, all of whom have played in the Big Dance before and are now desperate to return. 4. Troy (8-20, 6-10): We’re not going to pretend that Troy is a great team. As expected, the Trojans finished in the bottom portion of the division after losing five starters. This isn’t a team without talented individuals, though, including one of the SBC’s better scorers in Vernon Taylor, creative point guard Mo Weathers and rebounding machine Bernard Toombs. Yes, even bad teams have players that score a lot of points and grab a lot of rebounds, and impressive individuals don’t mean a whole lot when the team is 8-20. But don’t forget that Troy still won six games in this league and has the potential to light up the nets with its up-tempo style. 5. South Alabama (12-15, 6-10): It wasn’t the most successful winter for coach Ronnie Arrow, who’s more familiar with NCAA Tournament appearances than 6-10 conference records. Looking toward the league tournament and next season, though, there’s a bit to build on. Most notably, the play of underclassmen Augustine Rubit and Martino Brock was encouraging. As a freshman, Rubit grew into a double-double machine and even led the Sun Belt in rebounding. Meanwhile, Brock had a breakout sophomore campaign as the Jaguars’ leading scorer. The team as a whole still has a lot of deficiencies, most notably on the defensive end and perimeter shooting. So it’d be unfair to expect much out of USA in this tournament. 6. Florida International (10-18, 5-11): If Troy were to leave the Sun Belt, FIU would be in serious trouble. Since starting 3-0 in early January, the Trojans are the only team Isiah Thomas’ squad has beaten. The Golden Panthers lost 11 of 13 to finish out the season and despite individual contributions from a variety of newcomers, they’ve failed to defend, make free throws and find any kind of cohesiveness. There’s not a whole lot of evidence to justify FIU winning more than one game in Hot Springs. 1. Louisiana-Lafayette (14-14, 11-5): Do you believe in momentum? We do. It’s not that the Rajun’ Cajuns 11-game winning streak will automatically lead to an SBC tournament title. The streak is just proof that ULL is an entirely different team than it was in mid-January. The emergence of freshman forward J.J. Thomas has been a catalyst the past two months, and Josh Brown’s return from injury has helped as well. Bob Marlin, well known in basketball circles for his work at Sam Houston State, is a great bet to lead his team to the NCAA Tournament. Louisiana-Lafayette runs its variation of the Princeton offense and shares the ball well enough to cause any team problems. 2. Arkansas State (17-4, 11-5): Speaking of coaches, John Brady has a decent resume, huh? The guy’s been to a Final Four at LSU, after all, and the reigning SBC Coach of the Year has his team in position to make a run this weekend with the top seed in the West. Although ASU has struggled on the road, a neutral court could be a different story—and Hot Springs is in Arkansas, of course, so ASU has just a three-hour drive to make. The depth of this team will make a difference, too, as Brady plays nine players regularly in his rotation. 3. Denver (13-16, 9-7): Despite the tailspin late in the season, don’t forget about the Pioneers. During that 6-0 start in January, this team looked perfect in terms of offensive execution. Denver has a lot of shooters, a dangerous freshman in Chris Udofia and an excellent offensive system under coach Joe Scott. If DU can slow the tempo and make things ugly, it’ll have a chance to advance. 4. North Texas (16-10, 8-8): If a defending champion in a power conference finished 8-8 in league play and tanked during the regular season like North Texas, fans would probably look ahead to next season to shake off the disappointment. In the Sun Belt, though, a successful season is still a possibility thanks to the wide-open nature of the conference tournament. Josh White and Tristan Thompson have starred in this program for four years now. They’ve made NCAA Tournaments and won division titles, but they’ve now got to win four games in four days to avoid failure in their senior seasons. 5. Arkansas-Little Rock (15-16, 7-9): Like Arkansas State, UALR has played well at home but not on the road. Luckily, Little Rock’s even closer to the tourney than Jonesboro: it’s a one-hour trip to Hot Springs. If the Trojans had even one legitimate forward, they’d probably have won the West. They’ve struggled to find frontcourt scoring all season, so this would be a nice time for Courtney Jackson to break out like many expected he would in the pre-season. 6. Louisiana-Monroe (7-23, 2-14): The only chance for ULM to shock Hot Springs this week is for Fred Brown to go to Anthony Johnson on someone. And he’d have to do that four times for the Warhawks to advance to the NCAA Tournament. That’s a lot to ask of the former Kansas State transfer, although he’s been fairly reliable this season as ULM’s star. This entry was posted on Saturday, March 5th, 2011 at 2:28 pm by Brian Goodman	and is filed under 2011 conference tournaments. Tagged: Alex Tucker, arkansas state, arkansas-little rock, augustine rubit, Bernard Toombs, bob marlin, brett royster, brian stafford, chris udofia, courtney jackson, denver, don maestri, florida atlantic, florida international, Fred Brown, isiah thomas, james washignton, Jason Jones, jj thomas, john brady, josh brown, josh white, juan pattillo, ken mcdonald, kermit davis, Kore White, louisiana-lafayette, louisiana-monroe, martavius adams, martino brock, middle tennessee state, mike jarvis, mo weathers, north texas, ray taylor, ronnie arrow, sergio kerusch, Solomon Bozeman, south alabama, Steffhon Pettigrew, Travis Bureau, tristan thompson, troy, Vernon Taylor, western kentucky. You can follow any responses to this entry through the RSS 2.0 feed. You can leave a response, or trackback from your own site.